Junot Diaz wrote parts of his books, The Brief Wondrous Life of Oscar Wao and This Is How You Lose Her, on the Vineyard. Earlier this summer, Junot Diaz was driving through Edgartown when he saw the sign for the Noepe Center for Literary Arts. Mr. Diaz has been a regular visitor to the Vineyard since 1988, but this was the first time he had noticed the literary center. He immediately checked in with Justen Ahren, the founder and executive director, and asked what was going on. Junot Diaz burst onto the literary scene in 1996 with the publication of his book of short stories, Drown. In 2007 he won the Pulitzer Prize for his second book, The Brief Wondrous Life of Oscar Wao. His third book, This Is How You Lose Her, was a finalist for the National Book Award. Mr. Diaz grew up in the Dominican Republic and then moved to New Jersey at the age of six. During his career he has not only given voice to the immigrant experience, he gave it cojones. Mr. Ahren immediately asked Mr. Diaz to give a reading, which the author will do on Thursday, July 30, at 4:30 p.m.
“And if everything works out for us, next year we’ll do more,” Mr. Diaz said in an interview this week on Main street in Vineyard Haven. Due to a bad back, he stood during the conversation, which seemed appropriate. Like his writing, Mr. Diaz does not speak in whispers. His message is booming and articulate. Passersby stopped to listen, and more than one thanked him for what he said. His books speak for themselves. His acknowledgements rock, too. His are not the dusty list of thank-yous or quick sign-offs to mom or a loved one. In Drown he thanks the Welfare Poets for giving him music, and his teachers and librarians for giving him books. He pledges his life to others and acknowledges his mentors as miracles. One reason Mr. Diaz takes so long between projects is his ambivalence with the process, he said. But he is not talking about the angst of an artist or writer’s block. For him the experience goes much deeper, to a cellular and societal level. But while the process may be counter to his way of life, the result does not feel this way. The long wait for Oscar Wao may have had many wondering what happened, and more than a few whispering one-trick pony, but the reality was that Mr. Diaz needed to learn how to drive this new machine. He draws inspiration from other writers and from reading. He has said that his one main super power is reading, and that he can keep going and going and retain it all. Throughout his career he has also maintained a friendship with Edwidge Danticat, an award-winning writer in her own right who was born in Haiti and moved to the U.S. as a young girl. Haiti and the Dominican Republic share a land mass but there are deeply rooted prejudices between the two societies. Not that Mr. Diaz is resigned to the hopelessness of our fate, or the fate of his people. The world he conjures up and what happens to his characters can be painful and is often brutal, but it is always brought forth with such comedic adrenalin and deeply felt sympathy that the result is hopeful even when searing. He also works hard to give back a part of what he has learned. Over a decade ago, he created Voices of Our Nation, a writing retreat center in Miami for writers of color. He also teaches at MIT, which on the surface might appear to be a much different population than the one he works with in Miami. But at its core, he feels it is one that needs just as much tenderness and help. “A statistic said 1,000 undergraduates commit suicide in the American school system every year,” he said. “That’s not just the stuff that’s happening at home. These kids are under a lot of pressure. Not just the schools, but the whole country has overwhelmingly decided that the best way to deal with young people is to make them deeply afraid of everything. And to convince themselves that their school success is the only measure of their worth. And you wonder why so many of our kids find it so difficult to have a healthy positive sense of themselves . . . . You can’t be a person of value in an of yourself. What are your grades, where did you go to school, what job you got, what you make, that is demolishing to anyone — and imagine someone who is young. Speaking of immediate results, when asked what he is working on now, Mr. Diaz responds without hesitation. And with that Mr. Diaz walks off. Not to think deep thoughts or scribble away in a cafe. He is headed to the hospital where he spent the better part of the day before. A friend’s son took a header on his bicycle and he wants to be with him, to sit by him and see what he can do to help. That is what he is working on now, right now. 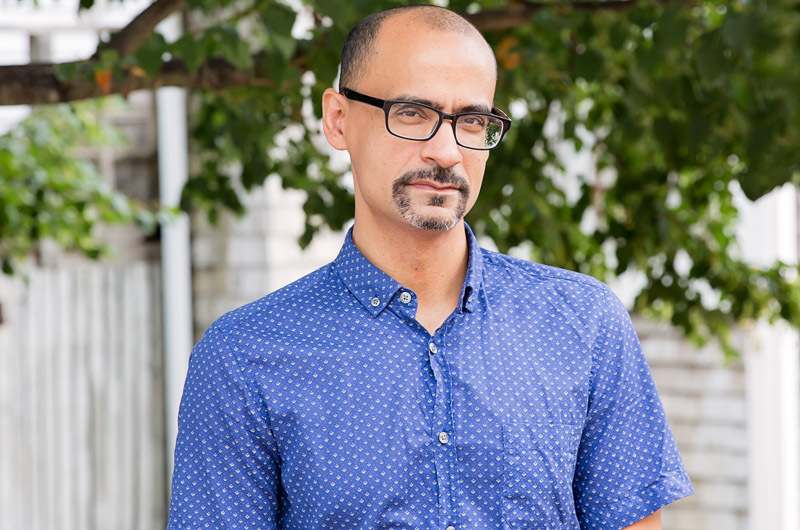 Junot Diaz will be at the Noepe Center for Literary Arts at 104 Main street, Edgartown on Thursday, July 30, from 4:30 to 6 p.m. Tickets are $25. We are going to see Diaz -- the man who should have won 2 Pulitzers for the beautifully crafted "Oscar Wao!"